The great thing about going to book conferences is that there you are, penned up with a bunch of other people who all love books. This time it was the Poisoned Pen Con in Phoenix, a small, intimate gathering with single-track paneling where you have time to visit with other readers and hobnob with your favorite authors. One of my favorite authors is Francine Matthews (aka Stephanie Barron) and she and I and Barbara Peters were talking about our favorite Golden Age mysteries. They were as one in declaring The Tiger in the Smoke to be one of their favorites. I’d read a couple of the Albert Campion novels way back when, didn’t like them much and moved on, but if Francine and Barbara say it it must be so, I picked up a copy. London, 1950. Beautiful couturier Meg Elginbrodde lost her husband in World War II and after mourning him for five years has become engaged to Geoffrey Levett. Unfortunately, as soon as they announce their wedding photos of her previously deceased husband begin appearing in the society journals, and she calls in Campion for help. There is some lovely description here, especially of the oppressive London fog, “a saffron blanket soaked in ice-water” and “[the fog] oozed in ungenially, to smear sooty fingers over the two elegant young people who sat inside” and “greasy drapery.” Yeesh. Charlie Luke in his spiv civilians looked at best like a heavyweight champion in training…His pile-driver personality…It made him an alarming enemy for someone. When he is detailing a subordinate to accompany an unwilling Canon Avril, Luke says, “He’s my senior assistant, a quiet, discreet sort of man,” he added firmly, eying the sergeant with open menace.” You’d develop quiet discretion, too, if Luke looked at you that way. He believed in miracles and frequently observed them, and nothing astonished him. His imagination was as wild as a small boy’s and his faith ultimate. In ordinary life he was, quite frankly, hardly safe out. Francine and Barbara recommended the next two books in the Campion series, too, The Beckoning Lady, which I’ve already started, and Hide My Eyes, which is on my to-read shelf. If you haven’t already tried them try “More work for the Undertaker” and “The Fashion in Shrouds” which I think are two of her very best. PS May I take the liberty of saying how very much I enjoy your work, particularly the Kate Shugak series? I’m really looking forward to reading the next installments once they’re available here in Scotland. Allingham certainly knew how to write a title, Alison. Thanks for the recommendations, and for the compliments! 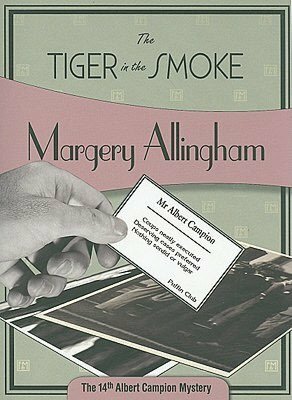 Dana – I can’t believe you haven’t read Margery Allingham! Enjoy yourself. You’re inspiring me to go back and reread them. Thanks. Just going to my library website to see what I can find. For sheer old fashioned detective work you should try the Allan Pinkerton series. And yes, this is the original ‘Pinkerton’… I started with ‘The Burglar’s Fate and the Detective’. It is a fascinating look at America when Chicago was at the edge of the far west – and it is wonderfully descriptive of travel & people of the times. They are all free too. The Pinkerton books sound like a fascinating read, Stephanie, thanks so much for the suggestion. Thanks, Julia! Good to know about your biography, too. Someday I’d like to see a lit class on the women writers of the golden age of detective fiction.